You must be a member of the Bologna Professional Networking Group to attend this activity. Would you like to join this group? Welcome everyone to the first Business Networking events of the year! 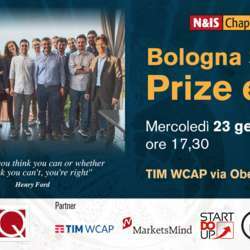 Third edition of the Bologna Startup Prize: we will share the 'best in class' ideas from the business plan competition of Automation Engineering. Last but not least... We will share with you the activities planned for the Protected content introduce you to the team!